Cold, cough, sore throat, congestion, indigestion…oho!….then no more procrastination! Off to the garden, pluck them…those succulent, strong scented (has the aroma of oregano but a bit more pungent), thick, roundish, spongy, green foliage with toothed edges from an evergreen shrub that grows and spreads so easily even in gentle weather. Pluck a leaf or two, boil them in hot water and sip the decoction (kashaya) when you feel sick especially with common cold or abdominal ailments. Wanna add a drop of honey and lime for that zing thing….yes please! 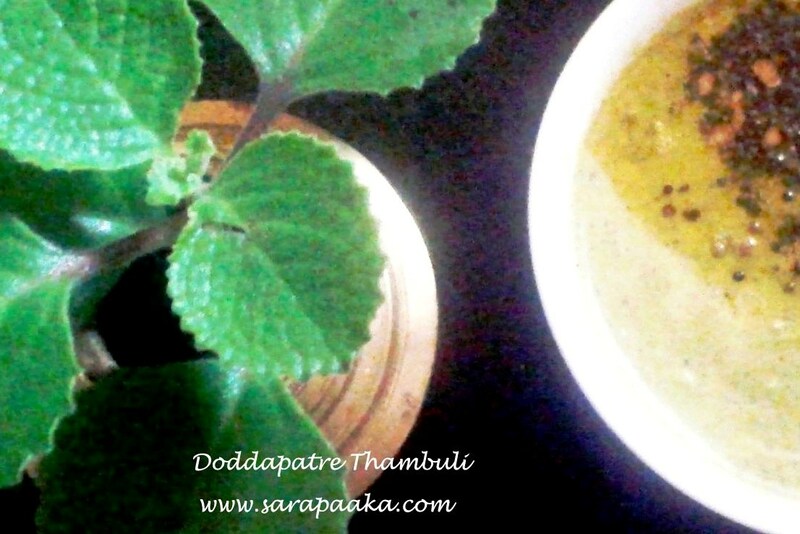 Thambuli, a simple yogurt and fresh coconut based preparation, cool dish ideal for hot summers, so healthy n tasty, so lovingly prepared and sweetly served by moms, yet so easily turned down by kids, only to realise later in life….”Well, it’s our turn now to be turned down by our kids”!!! Fortunately, I for one, at a very young age … by teenage, that’s right, had realized the importance of eating healthy, which made my Amma happy! How about you? Curry leaves 4 to 6 nos. Wash doddapatre leaves thoroughly in salt water. Drain out the water and keep the leaves aside. Wash curry leaves also and keep aside. Grate fresh coconut and keep aside. Heat ghee in a skillet. Add cumin seeds and pepper corns. When jeera turns brown, add green chilli and washed doddapatre leaves. Sauté them on low flame for 3 to 4 min. till you see the leaves wilting, watering and changing colour. Switch off the flame and transfer the contents to a plate. Let it cool. Now added grated fresh coconut, salt and asafoetida to this plate. Grind them in a mixie jar using minimum amount of water to a paste consistency. Transfer the contents to a bowl and now add fresh curd / buttermilk and blend them well with a spoon. It’s time to do seasoning…. Heat ghee in a small skillet. Add cumin seeds, red chilli and curry leaves (in that order). Fry for five seconds. Switch off the flame. Pour this seasoning on to the bowl. Doddapatre Thambuli is now ready. Serve it cool with hot steaming rice, pickle and papad. Leaves can even be chopped to smaller size before sautéing. You can use pepper corns / green chillies or a combination of both for the spicy taste. Coleus Aromaticus, Plectranthus Amboinicus, Cuban Oregano, Country Borage, French Thyme, Spanish Thyme, Mexican Thyme, Mother of Herbs, Saviara Sambara, Sambrani soppu, Sambara balli, Karpooravalli are a few other terms used to describe Doddapatre leaves.